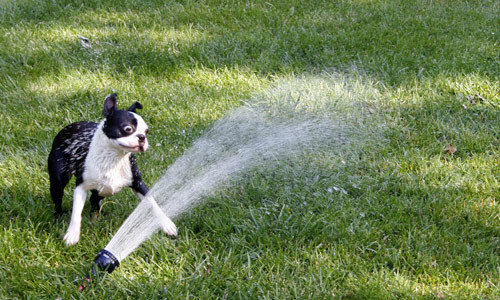 Sometimes, all a little dog wants to do is run through the sprinkler when it’s hot outside. Can you blame them? It’s been awhile since I posted a picture of the dogs. They are awesome as usual. After a mild heat streak last week, it has now cooled off and it feels like fall is here. I took last week off from work and was busy, busy with lots of different projects and generally enjoyed the amazing outdoors (hence, no posts). Soon, I will have some finished projects (remodeling, music?) and books to report on. 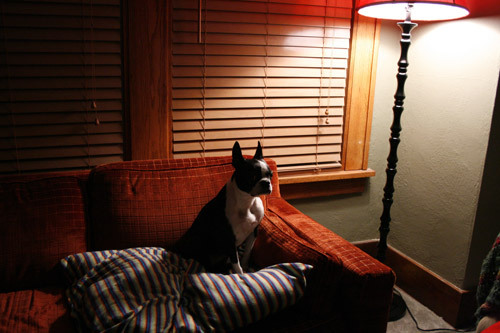 Until then, a picture of Zoey hanging out on our landing and looking very suave. 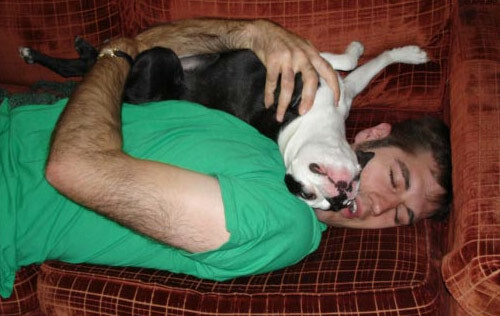 If you have a pet, you probably already know that they’re one of the best forms of stress relief and therapy out there. I would agree. 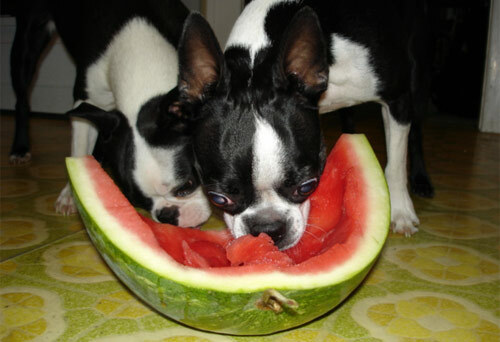 My dogs can eat a whole watermelon! If you get the reference in the title of this post, you are way cool, but in fact our dogs cannot eat quite a whole watermelon (even though I’m sure they’d like to try). During the summer, a little bit of cold melon has become a big favorite of both Elsa and Zoey, so tonight I decided to get a snap of them getting their fruit scraps and making a bit of a mess in the kitchen. Yes, this household is a bit silly. Almost a month ago to the day, we took another little dog into our lives to keep it from going to the pound. With two dogs in our household already, we figured that a third wouldn’t be a whole lot more work, and at some points she really wasn’t. 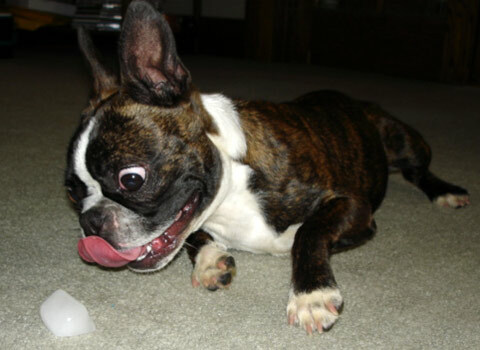 Unfortunately, Lucy just hadn’t gotten much obedience training at all in her life, and at other times she was a lot of work to manage (and clean up after). 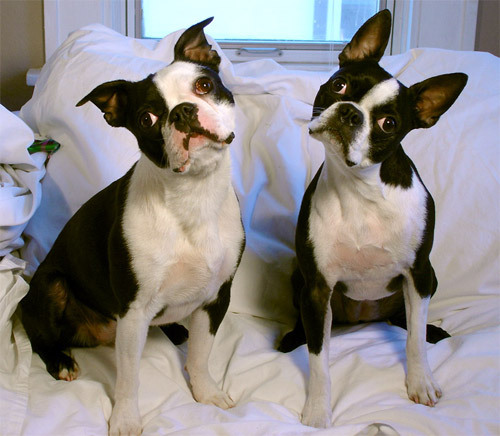 Although we were managing all three dogs fairly well after a couple weeks, it didn’t seem quite fair to our two original dogs, who had been displaced a bit by the newest puppy. 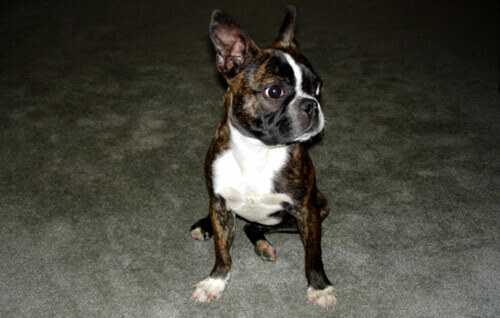 Because of this, TG called the local Boston Terrier rescue contact about a week back and within less than a day they’d found a great home for Lucy, with a family who does obedience and agility training. Even though she was a good bit of effort sometimes, it was definitely sad to see Lucy go. 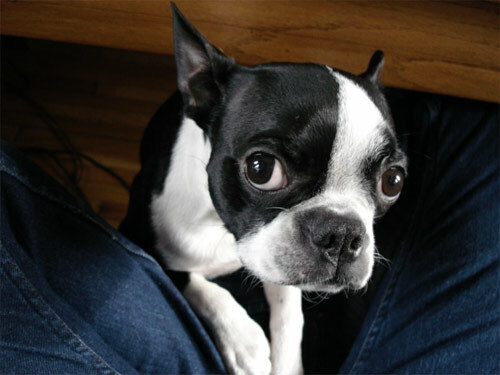 She was a loving little dog who really, really liked to play fetch and simply snuggle whenever someone would let her. Oftentimes while cooking dinner, she’d come into the kitchen and just sit by my feet, waiting until I was finished. In only four weeks, she managed to secure the nicknames of “Gremilin” (her crooked ears), “Snorter” (she’d make a loud snorts right before she went to sleep) “Spider Monkey” (her climbing abilities, including over a dog gate), and “Turdburglar” (affectionately, due to her *ahem* sometimes disgusting eating habits). She will definitely be missed in this household, but we know that she’s going to a home where she can get loads of attention and she’ll make someone a good pet. When I was at the store last weekend, I was looking through the green peppers and noticed one that stuck out like a sore thumb. It was about 3 times as large as any of the other peppers, and basically looked like some sort of freakish mutant pepper. It was completely normal in all other respects, but nonetheless I had to purchase it. 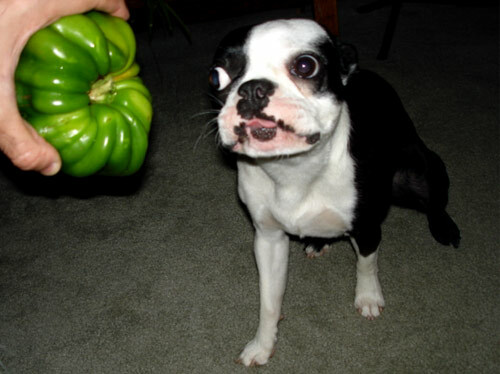 It was so large that it frightened our dogs., who usually enjoy eating little bits of green pepper when I’m cooking. 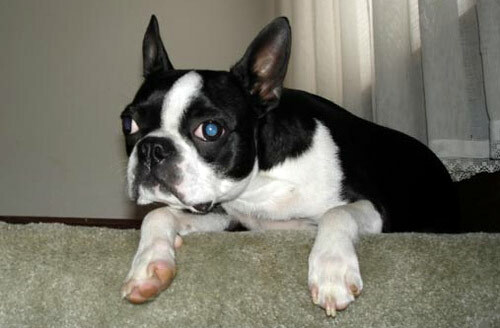 On Friday, TG got a call from a friend of hers about an immediate need for a foster home for a little Boston Terrier. This particular dog had bounced around from home to home and the current owner of said dog was planning on taking them to the local pound. Because we have a little room and are suckers for little dogs, we decided that we would give the little pup a home.